Immerse yourself in Madden like you've never seen before-with the most photorealistic game to date, powered by the celebrated Frostbite engine. Play games, collect rewards, and upgrade your team with daily, fun, and engaging content updates including legendary NFL players exclusively found in Madden ultimate team. 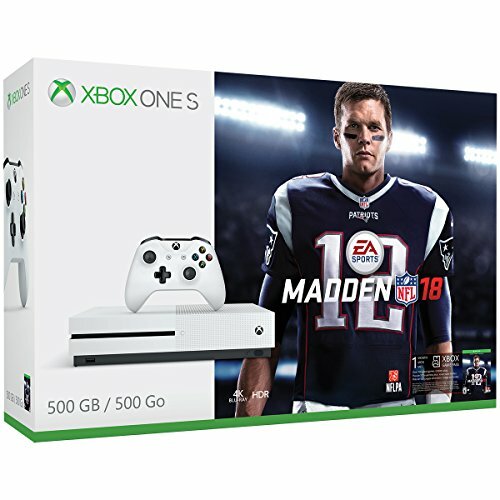 The Xbox One S 500GB Madden NFL 18 Bundle, featuring a full game download of Madden NFL 18, 4K Ultra HD Blu-ray, 4K video streaming, High Dynamic Range, premium audio and an Xbox Wireless controller. Graphics powered by the renowned Frostbite engine make this the most visually stunning Madden yet. In Madden’s first-ever story mode, Longshot, you can play the journey of an NFL prospect’s road to the Draft – on and off the field. Team up with friends and compete online together in MUT Squads. Play each matchup to your specifications by selecting from three new Play Styles or play the best real- world matchups each week in Play Now Live! With the biggest blockbuster titles, over 100 console exclusives, and hundreds of Xbox 360 games, there’s never been a better time to game with Xbox One.